Last week we kicked off our "School-Drop Off Style" series in which I share with you what I wear to drop-off my two-year old at pre-school (here's my first post in case you missed it). For today's look, I paired this Madewell sweater underneath a collared shirt and dark skinny jeans. Dark jeans are always a must-have in my book for new moms. They're very versatile and help conceal any food stains (my little guy loves spilling food on me during breakfast). These shoes are actually from Crocs and were designed by Italian designer Stefano Furiani. They're very comfortable, which is the first thing I look for in shoes. To finish off my look I added oversized sunglasses to conceal dark circles or when I don't get to do my make-up in the mornings. 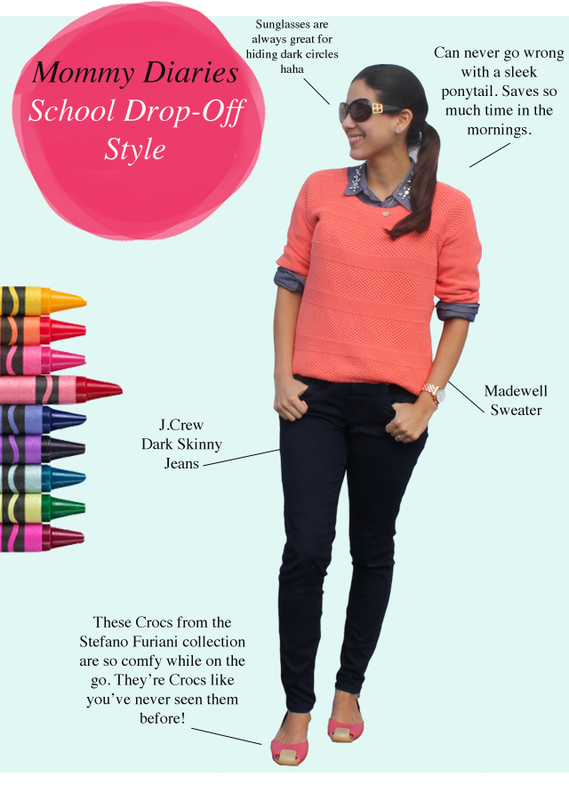 What are some of your outfit go-to's when it comes to school drop-off? This post is brought to you in collaboration with Crocs, a brand which our family loves. All opinions as always, are my own.